Note from April 2017: Most or all of the links on this page are outdated. I'll fix them soon. I've recently started studying Kamana again. Part of this is doing the secret spot, another part will go into animal and plant information pages which I'll put up on this website. 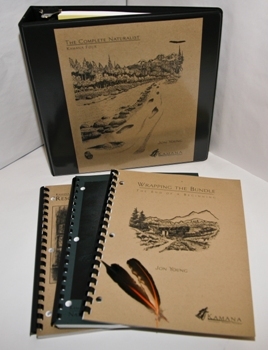 The Kamana program by Jon Young, founder of Wilderness Awareness School, is an awesome correspondence course teaching wilderness and native skills and awareness. The focus is more on native awareness and on learning your local environment (the plants and animals) than on specific survival skills. With this course, the emphasis is less on skills like making shelters and more on awareness, feeling and being at home in the wilderness, knowing the habits and survival uses of the animals and plants in your local area (or the area you want to learn about), moving without being seen, becoming aware of what is going on around you in the bush, and much more. The skills you will learn in Kamana are the foundations for being completely at home in the wilderness in a way that you could never achieve by quickly cramming some practical/technical survival skills. So it is ideal for people who are interested in survival skills as a long-term committment to learning an entire way of life. It is also ideal for people who are not so interested in wilderness "survival" as such, but want to learn to appreciate and feel more at home in nature. Wilderness Awareness School has a policy of teaching absolutely no (what they call) "survivalist doom and gloom". Everything they offer is required to be 100% positive and inspiring, and they definitely live up to that. The author of the Kamana program is Jon Young, who was the first student of Tom Brown Jr. There are four levels to the course. I have completed Kamana One and have been working away slowly on Kamana Two. Below are examples of some of the work that you do as part of the Kamana program. The drawings are not meant to be artistic or even particuluarly technically correct. The main purpose of drawing in the course is that it is a great aid to learning the identifying details of what you are drawing. It also helps you to bond with the creatures and the plants in a way that goes beyond just reading about them in books. 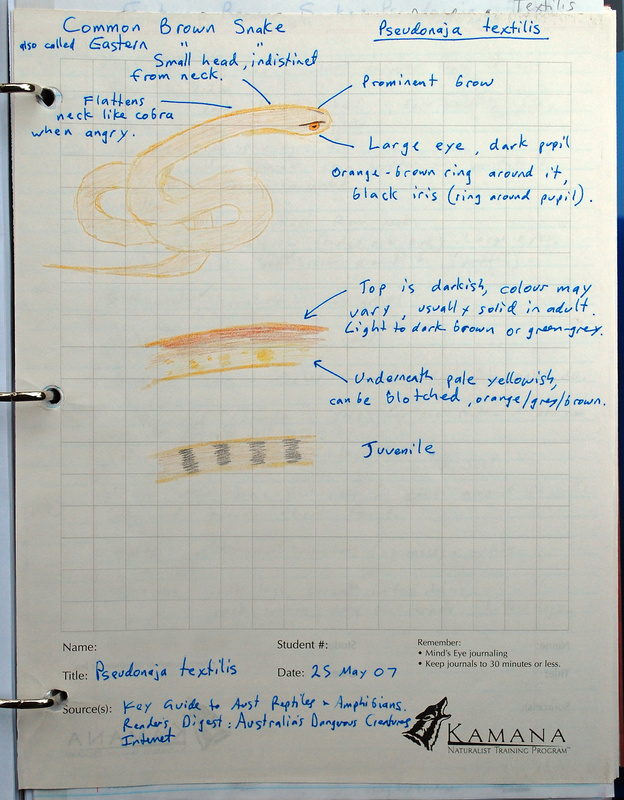 The rest of this page is taken from the document "Songline - An Introduction to Wilderness Awareness School", available for download as a PDF from their website. You can also download the Birds Chapter from Kamana Two, and the Sense Meditation (Both as Adobe PDF files) from the Kamana Samples section if you follow the links on their site. The following six tracks are imbedded in both trails throughout all levels of Kamana. As you progress, you will be taken deeper into each of these subjects. 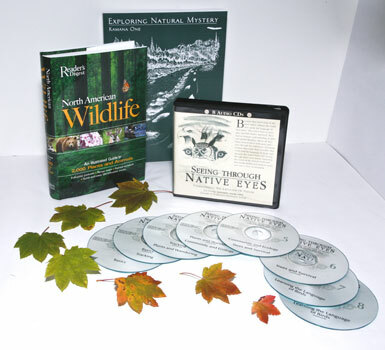 Inspirational stories from native elders and people closely associated with the natural world; organization of resources; understanding the “mind’s eye” technique for study; bringing books to life; self-sufficiency skills in using resources; foundations of taxonomy; hazards of the wilds. The Shikari is a tracker in the traditions of the Kumoan region of India. This track is named in honor of Jim Corbett, famed Shikari. This section focuses on the real basics of how tracking is learned through self-guided study. 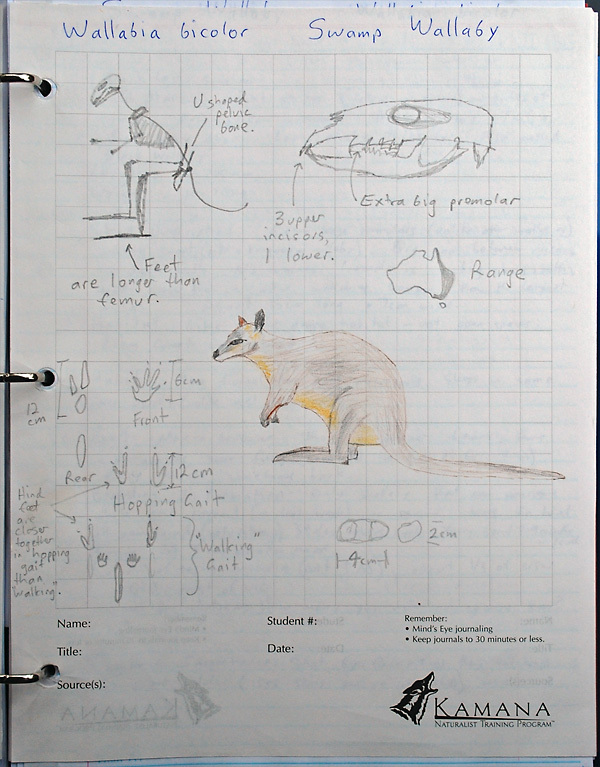 Natural history of mammals; physiology of animals; dominant sense patterns; survival strategies. Kamana Training will give the basic knowledge needed for tracking skills: identification of sign, aging, event sequencing, ecological tracking; tracking as an interpretive art; using tracking skills in the modern world for environmental protection, preservation, and rehabilitation. The Msafiri is an Akamba who knows how to live off the land, one who specializes in the knowledge of plants for survival and use in medicine. Safe preparation for foraging; research skills in native use of plants in crafts and as a source of medicine; wild herbaceous plants and ecology; basic taxonomy of plants for field identification. Kamana Training will give the basic knowledge needed for overland navigation techniques including aidless navigation; map and compass use for bioresource assessment. This track is a study of humans living with the environment in the past, present and future. Ecosystems and indicator species; interdependency of species in an ecosystem; ecology as a basis for prediction of animal behavior and plant species location; interplay of extremes and bird’s eye viewing of land features; invertebrates, amphibians and reptiles; conservation ecology; the history of the land and the native peoples’ staple resources; natural community dynamics; leadership in the field of environmental education, stewardship. This section is named after the Lakota word for “scout.” A scout is one who knows the ways of survival and living off the land. 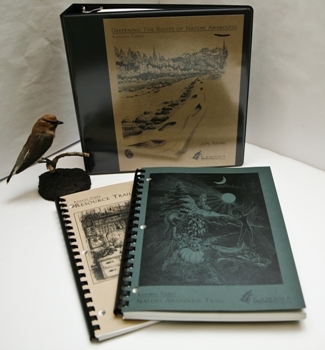 Field dendrology (study of trees); “landmark” tree studies; ecological niches and tree communities; trees as they affect aspects of the landscape; use of trees for survival and in native lore. Kamana Training will give the basic knowledge needed for learning to find and safely use water resources; safe use of fire and fire skills; shelter, from rock overhangs to Longhouses; procuring food in times of need; crafts for survival. Dawa is Kikamba for “Medicine.” Ingwe, Tom Brown and so many native teachers we have worked with have all expressed this understanding to us: Learning to use your senses to their fullest quiets the mind and opens the heart to the sixth sense and the spiritual ways of life so similar among all Human Beings the world over. This track focuses on those things which help us “Lose our Minds and Come to our Senses!” Taxonomy and physiology of birds; migration and range maps; understanding the language of birds; sensory development; invisibility: moving with grace and ease using birds and animals as teachers; finding solitude in the wilderness for self-development and self-awareness. If you are interested in this program, I highly recommend the Seeing Through Native Eyes audio series by Jon Young. The six audio tapes (of the original cassette version) correspond to the six tracks discussed above. Although it is part of the Kamana course, it is also designed to be used on its own—that is, it's also an excellent resource for people who are not doing the Kamana course. 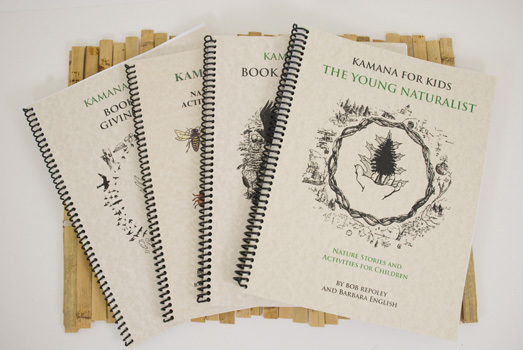 There are four levels of the Kamana Program, plus "Kamana for Kids". Kamana One is shown at the top of this page. Note that Kamana One uses North American resources, but in the other levels you use resources (field guides, etc) that are suited to your own country (such as Australia). There are not that many animals and plants studied in Kamana One compared to the other levels, so it is easy to pick ones (such as the Red Fox) that are found in Australia. For more information about the Kamana program, see the Wilderness Awareness School website.